Webster's Dictionary defines a skyscraper as 'a very tall building.' Chicago invented them, New York City has perfected them and Newark has been building them for more than a century. The grandest of all has disappeared and was actually a series of important buildings, one of the nation’s first office complexes, when constructed on Broad Street, near Market Street, by the Prudential Insurance Company. Ground was broken for the first structure in 1890 and it was dedicated in 1892 with an impressive dinner for 2,200 people at Caledonia Park as well as a glittering banquet for the nation’s insurance elite at Delmonico’s Restaurant in New York City. John Dryden, Prudential Insurance’s first president, wanted a building designed to impress by strength and solidity. And impress it did! The first building in the castle-like complex was constructed of 5 million bricks, contained 12 miles of beams, and was serviced by a host of bird-cage type elevators. In 1901 came a 12-story addition with a posh executive suite. The board room in French Renaissance style was constructed of Caen stone and filled with Belgian crafted black walnut paneling. Its ceilings were covered with murals by E.H. Blashfield and Siddon Mowbray and illuminated by hundreds of light fixtures patterned after those of the Church of San Giorgio in Venice. From tiny acorn to giant oak was the story was Prudential grew from its small Broad Street office until it occupied one of the nation’s largest office complexes. But decentralization of the 1940s was to check this seemingly limitless growth in downtown Newark, with regional home offices spreading across the U.S. and Canada. And in 1956, the company pulled down its great European-style headquarters to seek a new image in a new Newark in a new time. 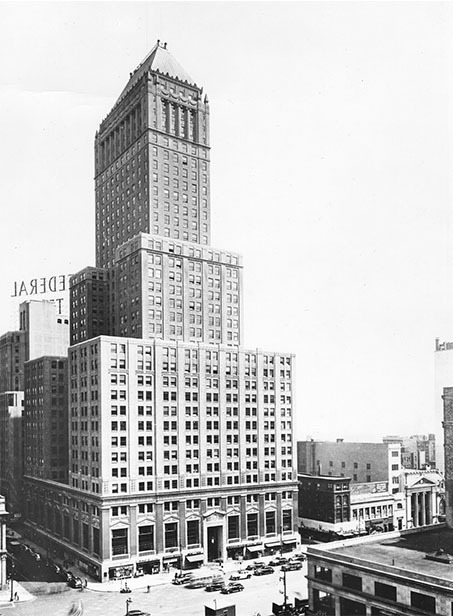 Newark’s next two skyscrapers were built at the Four Corners prior to the city’s 250th anniversary celebration in 1916. The Fireman’s Building is a 16-story structure on the northeast corner that replaced a French empire style office building that was home to the old First National Bank. Its inception was in 1908 and by July 1910 it opened for business. For some years, Fireman’s was the state’s tallest building and it originally was decked with red and white awnings from the first to top floors. Across the street, the Kinney Building, erected in 1912, occupied the southeast corner of Broad and Market and was once the home of The Newark Star as well as the Postal Telegraph and Cable Company. It was designed by famed architect Cass Gilbert. In 1927, the pillared first floor colonnaded porch, similar to the top of the building, was removed for the expansion of ground floor business operations. In 1925 the Military Park Building was constructed by the park bearing its name and included several architectural motifs associated with the name. Its castellated roofline was designed to look like a medieval fortress and the military figures and symbols, located between the windows, presented the military theme on the front of the building. Its 21-story façade is composed of masses of various heights that are dominated by a corner tower. Designed by the New York firm of Polhemus and Coffin, it briefly held the title of the state’s tallest building. Today it has regained a place of note overlooking the newly renovated Military Park. And no longer is its handsome façade partially obstructed by the old PSE&G office building, looking north from Raymond Boulevard. Located on Broad Street, across from Washington Park, the old New Jersey Bell Building is one of the most impressive buildings ever built in the city’s commercial center. It was designed, built, and opened, just before the economic crash of 1929. It rises 20 stories, or 275 feet, and was designed by the New York architectural firm Voorhees, Gmelin, and Walker in the American Perpendicular style. The building boasts 12 high-speed elevators, 1200 windows, a central vacuum cleaner system, and hundreds of miles of wiring for both lights and telephones. Supporting the building’s bulk is 4850 tons of steel girders and 66,000 rivets were used to hold together the steel skeleton. The exterior is made of more than 3 million bricks, and 3000 gallons of paint were used to brighten the interior spaces. The art deco lobby is stunning and the classical caryatids along the outside third-floor cornice talk to each other on 'modern' telephones. And while New Jersey Bell is gone the magnificent building continues in the heart of downtown as part of the Bell Atlantic network. The two great jewels of Newark’s art deco era are the Lefcourt building (the Raymond/Commerce Building) and the National Newark and Essex Bank building (the 744 Broad Street building). While they are very much alike they always have been in earnest competition and for more than a half-century they have been more or less the symbol of 20th century Newark. Any picture taken of the downtown area has included these two massive architectural masterpieces. For most of their existence they have been the state’s tallest commercial towers – two unlikely twins, closely connected with local and statewide commercial enterprise. The 35-story Raymond/Commerce building was originally called the Lefcourt Building, for the New York City developer whose fortunes plummeted in the Crash of ’29. For this reason the large letter L over the front door remains today, but the name does not appear anywhere on the building. The structure was built on the site of the old city market, on land leased to the builder for 50 years before reverting to the city. Frank Grad of Newark was the well-known architect. The building’s exterior is constructed of tan brick offset with white limestone decoration. The roof cornice is of terra cotta and some say has the air of a Gothicized crown topping its 35-story office tower. There is a striking similarity between this and the other Lefcourt building 5th Ave and 43rd Street in Manhattan. The National Newark and Essex Bank, the other half of the art deco twins, was completed in 1930, when extra steps were taken to add another floor and a few more feet so the claim could be made that it was the state’s tallest office building. Exactly 649 steps led up the 34 stories to the penthouse but it was easier to take one of the 16 elevators. The Newark architectural firm of Wilson C. and John H. Ely, a father and son team, were creators of the handsome structure when Newark was the state’s undisputed capital of banking, insurance, and legal affairs. The top of the central tower, now illuminated at night, is said to be a copy of the Mausoleum of Halicarnassus, one of the Seven Wonders of the Ancient World. Today, occupancy is down; however, the potential for the building and its two classic neighbors – the Raymond Commerce Building and the nearby Federal Trust Building – is good. All three structures are sound, possess outstanding architectural merit, and straddle Newark’s transportation grid. They help form New Jersey’s most dramatic skyline.